Welcome to the home of Middleton Motorsports! Home of Mike Middleton and the 38m Racing team. Middleton Returns to the Valley for 09. But the Rain does as well. A return to the high banks of Lebanon Valley Speedway for the Middleton Motorsports team was the plan for May 9th, but Mother Nature rained on the parade. After a run through of all warm ups and 2 Pure Stock Features the skys opened up for a downpour of rain to end the night prematurely for all race teams on saturday including Middleton. Mike Middleton capped off his 2008 racing season with a 16th place finish in the, "BMC Motorsports 25" at Super Dirt week at the New York State Fairgrounds in Syracuse NY. Mike started 20th and kept stedy through the race and brought the car home in one peice to a 15th place finish. It was a sucessfull week for the 38m for its first time being to the "Moody Mie". ALERT: Middleton pulls off win in Futures Prostock Race at, "The Moody Mile". Mike came into his first Super Dirt week and made good of his first race on the Mile Picking up the win in the Futures Prostock event. Mike Started the Race in the 6th position outside of row 3. He quickly moved up to 3rd after a early caution. After that mike moved into the lead for a few laps and than had a great battle with fellow lebanon valley regular Steve Hankle. Hankle would eventualy take the lead back. Coming into turn 3 with 2 laps in the race Middleton made a power move and got by Hankle and never looked back. Next up for the 38m is practice sessions and qualifying for the BMC motorsports 25 lap prostock feature at High noon on Sunday afternoon. Check Back for more as the week goes on. Middleton and the 38m off to try to tame the "Moody Mile"
Every driver who drives in any kind of DIRT race car, wether it be a Modified, 358 modified, Sportsman, or Prostock circles this week in October. The Time has finally come and everyone is getting geared up for Syracuse and Super Dirt Week 37. 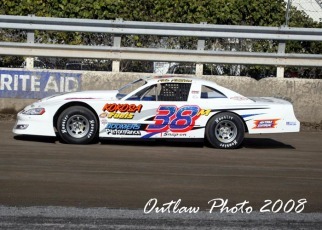 That includes this year Mike and the 38m Prostock race team. For the first time Mike will be at the moody mile to race for the first time. The week will start for the 38m on thursday late afternoon with Middleton participating in the DirtCar Futures Pro stock Event. After that the attention focuses to the the main event for the ProStock's. Fast Time Qualifying will be on saturday afternoon setting the majority of the field for the 25 lap feature. Than the focus turns to sunday with the last chance race early in the morning and the main event scheduled to go off at high noon on sunday. Good Luck to all who are running out there. Middleton Motorsports would like to thank everyone for a great 2008 season. We look forward to seeing you again in 2009.